1/35 German Destroyer Jagdtiger Tank Model Kit Discounts Apply ! 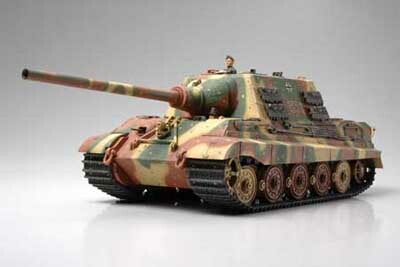 1/35 German Destroyer Jagdtiger Tank Model Kit. Completely new design. Interior details such as the gun breach area and the floorboards are reproduced. Commander and driver torso figures included. 5 kinds of markings for the 653rd Heavy Tank Battalion included. Along with its extended hull, the spare track link racks and jack are also realistically reproduced. The separately molded disc parts of the road wheels add extra depth to the model. Two kinds of tracks are included; easy to assemble belt type and connectible assembly type. A choice of stowed or extended traveling clamps. Photo-etched parts for the engine intake protective net included.